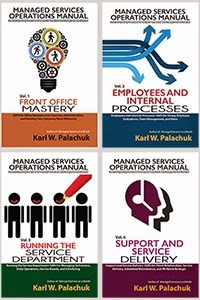 Small Biz Thoughts by Karl W. Palachuk: Deep Work - Stay Focused! I'm about halfway through Deep Work by Cal Newport. Really great book. I love the whole concept of Deep Work versus shallow work. Too many people no longer manage to work deeply. 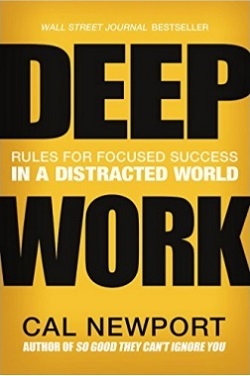 Deep Work refers to totally immersed, focused attention. Of course this fits perfectly with my personal mission to avoid distractions. Our society (and especially our technology) are 100% geared toward distractions. We fool ourselves into thinking we are more productive when we divide our attention more and more. Most people actually feel nervous and anxious if you force them to turn off their phone, turn off Facebook, turn off email, and so forth. All of those things can give us a dopamine buzz, but that just feels good - it's not productive! Ten years ago, the common advice was that you should not leave your laptop plugged in all the time because the battery would wear out sooner (This is less true with newer technology.). What happened when you never let the battery wear down is that it developed a "memory" that it only needed to charge a little bit. So when you finally did unplug the laptop, the batter wore out fast because it never got a deep charge. Your attention span is the same way. Sometimes you need to sit in a distraction free environment in order to let your brain learn how to operate without the distractions. But those distractions are counter-productive. Quiet and solitude are much more productive. Many people self-diagnose themselves as ADD or ADHD because they can't stand doing nothing, or doing only one thing at a time. They like the feeling of bouncing from one thing to another. In most cases, this simply amounts to the fact that they have lost the ability to sit quietly because they haven't practiced that skill. I can't count how many people have told me that they can't meditate or they can't sit quietly in a chair for ten minutes. Being calm and focused takes practice. You are always going to bad at all the things you don't practice. I've taken music lessons and singing lessons. And on a good day I can find middle C on a piano. Basically, I've never put in the practice it takes to learn these things. And this is not about being quiet for quiet's sake. Absolute high-level focus makes you more productive. It just does. Yes, it takes practice, but the rewards are spectacular. When you look at the most productive people you know, you'll find that they are experienced at turning off distractions and focusing on one thing at a time. Note: This will irritate many of your friends. Why didn't you text me back? Are you ignoring me? I want 100% of your attention instantly at any time of the day or night.
. . . Seems kind of unreasonable when you put it that way. But it's true. The rest of the world is more interested in interrupting you all the time than they are in your success. Only you can control this. You have to set the limits. And you have to start developing the habits of reducing distractions and indulging in super-productive, super-focused work. Agreed! I've been putting in longer and longer hours lately because the 8:30-5pm is ONLY distractions - leaving after hours as the only distraction free time. Whether it's the Skype/Slack pings that come from a distributed team, to the walkups / meerkats / shoulder taps from those in the open plan office, or the mobile phone texts / calls when you don't answer one of the other methods - it's almost IMPOSSIBLE to focus. I've read your Relax Focus Succeed book and was ironically too distracted to benefit from the course I paid you for - but there's a definite need to implement some of this or it's just going to be the end of me with longer hours, less wife time, and less ME time! We implemented the "headphone rule" at the office about 12 months ago (if you have your headphones on, don't disturb) but it soon dropped by the wayside. People (myself included at times) are too reliant on others these days - asking for a piece of information when it's a roadblock, rather than in advance! This means if you don't pause your own work to answer someone immediately, you are stopping them (and potentially others downstream of them) from being productive too! 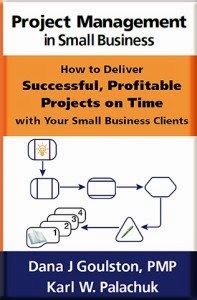 Also: When you provide a good book to read, would be great for us if you provided the ISBN and a non-affiliate link to Goodreads - and great for you if you either provide a link to it in your own bookstore on SMB Books, or an affiliate link to Book Depository / Amazon / etc!